MR. HEALY: The purpose of making an opening statement so soon after the last sitting, Sir, is to link this sittings and the last sittings mainly because, as you will be aware, the break in the sittings was due to a number of practical difficulties which arose in relation to some of the evidence due to be given, and also because some further inquiries were being made in the course of the giving of evidence during the last sittings, as a result of which some further information which is germane to some of the matters being discussed at the last sittings has now come to hand. Therefore some of the evidence which will be given at these sittings commencing today has been mentioned and outlined in an earlier opening statement. The two main items which have been mentioned already and in respect of which evidence will now be given concern Mr. Bernard Dunne and in particular, a payment which appears to have been made by him to Mr. Haughey in 1993. The other main item concerns the evidence of Mr. Haughey. The Tribunal has already alluded to queries raised by the Tribunal in correspondence with Mr. Haughey over a considerable period of time, culminating in a number of letters sent more recently to Mr. Haughey in which many of those queries were drawn together in a consolidated form. In Mr. Haughey’s evidence to the Tribunal at these sittings, it is envisaged that the Tribunal will be dealing in the main with his relationship with Allied Irish Banks and, if time permits, in part with dealings he had with Guinness & Mahon and to some extent with Guinness Mahon Cayman Trust. Now, as I have pointed out at the adjourned sittings, it was not possible mainly for logistical reasons to call a number of witnesses. These were mainly witnesses who were mentioned in the course of the evidence of Mr. Paul Kavanagh and those witnesses are Mr. Oliver Murphy, Mr. Gus Kearney and Mr. John Magnier. The Tribunal now expects to hear these witnesses and also expects to hear from Mr. Vincent Jennings in connection with contributions to the Brian Lenihan fund and, in Mr. Jennings’ case, in relation to a contribution made by Irish Press plc. The Tribunal, at these sittings, will continue to deal with those other matters which came to light as a result of inquiries concerning the raising of funds for the medical expenses of the late Mr. Brian Lenihan and it will be recalled that the inquiries into the raising of those funds drew the attention of the Tribunal to other aspects of Fianna Fail fund raising efforts in the 1980s and in the 1990s, but mainly in relation to 1989 and 1990. Where fund raising for Fianna Fail was concerned, evidence has been given by Mr. Paul Kavanagh, Mr. Mark Kavanagh, Mr. Eoin Ryan, Mr. Sean Fleming TD, Mr. Bertie Ahern TD, and by Dr. Michael Smurfit. Now you will remember, Sir, that Dr. Smurfit was not in a position to complete his evidence. This was due to the fact that at the time he last gave evidence, further information was still outstanding and certain documents were not available and it was felt preferable to conclude a number of other inquiries before continuing with the evidence. Evidence will also be given by Mr. Hugh Dolan in relation to Fianna Fail fund raising, in his case with particular reference to Fianna Fail records and one issue left outstanding at the last sittings in connection with the extent of the records made available to the Tribunal. In this opening statement, I intend to deal firstly with evidence in connection with contributions to the Brian Lenihan fund and thereafter I intend to pass on to the other aspects of Fianna Fail fund raising with particular reference to the completion of the evidence of Dr. Michael Smurfit. Firstly I want to mention the anticipated evidence of Mr. John Magnier. It will be recalled that in the course of the evidence of Mr. Paul Kavanagh, reference was made to a list of donors to the Brian Lenihan fund, a list which contained a reference to Mr. Magnier and a contribution he had made or was expected to make to that fund. The Tribunal has now obtained a statement from Mr. Magnier, who has confirmed that he recalls Mr. Lenihan’s illness in the late 1980s and also that around that time he was approached by Mr. Paul Kavanagh seeking contributions to fund expensive medical treatment in the United States. Mr. Magnier has informed the Tribunal that he was only too glad to support this cause and agreed to give a contribution of £20,000 in total. He was anxious, and he believes that he stressed this at the time, that he wanted his contribution to be completely anonymous. He is satisfied that his contribution of £20,000 was made up of two bank drafts of £10,000 each issued by Allied Irish Banks plc, Saint Patrick’s Bridge branch, Bridge Street, Cork. That was Mr. Magnier’s bank. Copies of the drafts have been provided to the Tribunal. Each is dated the 8th June 1989, is in the sum of £10,000 and is made out to a Mr. Jim Murphy and a Mr. Jim Casey respectively. These are in fact fictitious names and it was not intended that the drafts be delivered to any such persons. These names were used so as to maintain confidentiality. The payment of £20,000 in total appears to have been lodged to the Leader’s Allowance Account on the 14th June 1989. From information made available by Mr. Magnier, Allied Irish Banks and from the bank statements of the Leader’s Allowance Account for the relevant period, it would appear that the £20,000 formed part of a lodgment of £57,600 credited to the Leader’s Allowance Account on the 14th June of 1989. The Tribunal also expects to hear from Mr. Oliver Murphy. Mr. Murphy is one of the other names mentioned on Mr. Paul Kavanagh’s printed list. Mr. Murphy has informed the Tribunal that he was approached in 1989 to make a contribution to a fund to defray the medical expenses of the late Mr. Lenihan, that he was approached by Mr. Paul Kavanagh and that he made a contribution of £5,000. The contribution was apparently made by way of a cheque from Hibernia Meats and was apparently made payable to Fianna Fail. It was handed over in the Westbury Hotel and Mr. Murphy believes that it may have been handed to Mr. Paul Kavanagh. The Tribunal has instituted further inquiries with a view to locating the cheque, or a copy of the cheque and/or the bank statements of the account on which the cheque was drawn so as to enable the Tribunal to ascertain whether the proceeds of the cheque can be shown to have been lodged to the Leader’s Allowance Account. Mr. Gus Kearney was another of the names mentioned on Mr. Kavanagh’s list. Mr. Kearney’s name appears both in the manuscript list and in the typed list. Both lists are on the same piece of paper. Opposite his name is the number 10, which may indicate that a contribution of £10,000 was expected from him or that such a contribution may have been received from him. When this matter was drawn to Mr. Kearney’s attention, he informed the Tribunal that he does not recall that he received any approach to contribute to funds collected to defray the medical expenses of the late Mr. Brian Lenihan although he believes that it is possible that there was such an approach. Further inquiries are being instituted with a view to ascertaining whether any such contribution was made from funds under the control of MF Kent, a company with which Mr. Kearney was associated, as it seems likely that it was through that company that any such contribution was made. Unfortunately MF Kent is a company which operated through many different subsidiaries and associated companies and it may prove impractical in the long run to trace the payment, if any, although further inquiries are being made. The Tribunal will also revisit some of the evidence given in connection with a payment made to the Brian Lenihan fund by Irish Press plc. It will be recalled that evidence was given by Dr. Eamon De Valera that he received a request from Mr. Dan McGing seeking a donation of £10,000 towards the fund. His evidence was that he discussed the matter with Mr. Vincent Jennings in April or May of 1989. Mr. Jennings was at the time Managing Director of Irish Press plc and he recalls the approach and also recalls that after a short discussion he agreed with Dr. De Valera that it was appropriate for the company to make the donation. He says that it would have been normal for him to sign the cheque raised through which the donation would be made. You will recall, Sir, that to date, the Tribunal has been unable to identify that payment either as having been received by the fund or indeed identify any location or any account to which the sum of £10,000 would have been credited. Fianna Fail records in 1989 contained a reference to a payment by Dr. Michael Smurfit in the sum of £50,000. The payment was in fact recorded in Fianna Fail Cash Receipts as an anonymous donation, although Dr. Smurfit gave no such direction as to anonymity. As we have now heard, however, Fianna Fail documentation also contain a second list identifying certain donors, including anonymous donors, the receipts for whose donations were sent not directly to the donors themselves but to Mr. Charles Haughey. Dr. Smurfit’s donation was one of those on that list. The donation of £50,000 is recorded as having been received in the form of a single bank draft issued by Guinness & Mahon. The Tribunal has heard evidence that this draft issued by Guinness & Mahon was funded by two bank drafts lodged to an internal bank account at Guinness & Mahon. The two bank drafts which were lodged in order to fund this £50,000 bank draft were each in the sum of £20,000. According to the evidence given to Tribunal at its last sittings, the drafts in question had been handed to Mr. Haughey by Mr. Mark Kavanagh as part of an overall contribution of £100,000 to Fianna Fail funds and to the Brian Lenihan fund. You may recall, Sir, that that £100,000 contribution consisted of a cheque for £25,000 and three bank drafts each for £25,000. Each of those three bank drafts, amounting in all to £75,000, was payable to cash. The two bank drafts used to fund the £50,000 bank draft issued by Guinness & Mahon were routed through that bank in what was effectively an exchange whereby the two drafts for £25,000 each drawn on Allied Irish Banks were exchanged for one draft of £50,000 issued by Guinness & Mahon. That £50,000 draft was then recorded by Mr. Sean Fleming as having been received at Fianna Fail headquarters by way of a donation from Dr. Michael Smurfit and it was lodged to Fianna Fail accounts. The Tribunal has heard evidence that Dr. Smurfit’s own contribution was intended to be in the order of IR £60,000, comprising a IR £10,000 contribution to what was described as Fianna Fail East, and a IR £50,000 contribution to Fianna Fail Central Funds. The donation was made by way of a sterling payment in the order of £52,200-odd. The Tribunal has been informed that the £50,000 payment was debited to a John Jefferson Smurfit Monegasque Foundation Account and transferred to a Sterling Account at Henry Ansbacher & Company, 1 Mitre Square in London. The transfer was in fact to a Guinness Mahon Cayman Trust account at Henry Ansbacher & Company in London. The transfer appears to have been made to what we now know as an Ansbacher account under the control of Mr. Des Traynor. From evidence to date, it would appear that there was no transfer of this particular money to a Fianna Fail account. The Tribunal has been informed that Fianna Fail does not have an Ansbacher account. At the time when he last gave evidence in connection with this matter, Dr. Smurfit was not in a position to provide the Tribunal at short notice with all of the relevant documentation and he has since provided the Tribunal with documentation concerning this payment. It would now appear that an instruction was given from the Jefferson Smurfit Group plc offices at Beachwood, Clonskeagh, Dublin 14, to a Mr. Bruce Ferguson of Allied Irish Banks, Channel Islands, on the 14th June 1989, to arrange for a payment in sterling of the equivalent of IR £60,000 to the GMCT account at Henry Ansbacher in London that I have already mentioned. On the overhead projector you will see a letter from the Jefferson Smurfit Group plc offices at Clonskeagh, addressed to Allied Irish Banks in the Channel Islands with reference to the Jefferson Smurfit Foundation Trustees Limited Account with the account number and an instruction to transfer or arrange, rather, payment in sterling or the equivalent of IR £60,000 to Henry Ansbacher, 1 Mitre Square for the Account No. 190017202. And the request is that the payment be by way of direct transfer and that all bank charges are to be paid by Jefferson Smurfit. That instruction is signed by Mr. Austin, who is now deceased and who was at the time a director of Jefferson Smurfit. Now, you’ll see that that letter is dated the 14th June 1989 and the instruction contained in the letter appears to be related to an earlier debit to the Jefferson Smurfit Foundation Trustees Account. Now on the overhead projector, Sir, you will see the relevant bank statement on that account showing a debit to the account on the 26th May 1989 of £52,215. That is the debit which relates to the instruction contained in the later letter of the 14th June sent by the late Mr. David Austin. As that debit predates the instruction, it would seem reasonable to assume that there must have been some earlier written or other instructions authorising the withdrawal of a sum of money from the Jefferson Smurfit Trust Account even in advance of a formal letter of instruction. And this is a matter in relation to which further inquiries are currently being made. It would also be recalled when he last gave evidence, Dr. Smurfit confirmed that a member of his staff had telephoned Mr. Traynor on the 21st June 1989 to confirm that a payment of Stg £52,215 had in fact been made. Since he last gave evidence, Dr. Smurfit has provided the Tribunal with further information concerning the payment and specifically has informed the Tribunal that the John Jefferson Smurfit Trust by whom the payment was in fact made was originally set up in Jersey in the Channel Islands and that the sole trustee of this foundation was a company incorporated in the Channel Islands. There was a change in the structure of the trust in July of 1989 in that the John Jefferson Smurfit Monegasque Foundation, a Monegasque or Monaco trust, was set up to supersede the previous foundation. The Jersey trust company was also the sole trustee of the new foundation. Now if I could have the letter on the overhead projector again please. It also appears from further information made available by Dr. Smurfit that the manuscript writing on the payment instruction letter of that date was made by an employee of Jefferson Smurfit who has now left the company. It seems to refer to the classification of the payment in a database recording system maintained by the foundation. It says, “Registered under ‘Fianna Fail'” and then it seems to say “Pd” or “Paid, Deposit account, sterling.” Dr. Smurfit has also provided the Tribunal with an extract from the end of year printout for the relevant year and that shows a payment of £60,000, which is presumably a reference to Irish currency, recorded as a subscription to Fianna Fail under reference 89/302. The Tribunal has also been informed that the payment was brought before a routine meeting of the trustee company held on the 19th June 1989 to deal with this and other matters. A list of applications was put before the meeting and from an extract copy of the records of the foundation, it would be seem that this sum of £60,000 is referred to as being attributable to Mr. Des Traynor and is described as a political contribution in view of the forthcoming election, £60,000′ which must once again be a reference to Irish currency, and the reference number is 89/302, which tallies with the reference number on the computer printout that was on the overhead projector a minute ago. Now of course as the election had already taken place by the 19th June, this would again seem to indicate that there must have been some contact well in advance of the 19th June and, as I have already indicated, probably also well in advance of the 26th May and, as I have said, further inquiries are being instituted in relation to this aspect of the matter. While the Tribunal anticipates that Dr. Smurfit will be responding to a number of other queries concerning the documentation of this and related transactions, responses have already been obtained in connection with certain related queries and in particular, queries concerning dealings between Dr. Smurfit and the late Mr. Desmond Traynor. Dr. Smurfit has informed the Tribunal that he recalls telephoning Mr. Traynor to inquire whether he or one of his companies would be interested in becoming a member of the K Club. Dr. Smurfit does not recall the date on which this telephone conversation took place but believes that it could have been in late 1989 or 1990, but that it is also possible that it was in 1991. Dr. Smurfit, on behalf of the Jefferson Smurfit Group, was promoting the membership of the K Club over this period of time. He has informed the Tribunal that he does not recall the conversation in detail but he does recall that the late Mr. Traynor declined to join the K Club but took the opportunity of mentioning to Dr. Smurfit that he (Mr. Traynor) was seeking to raise funds to assist Mr. Haughey who, according to Mr. Traynor, was in financial difficulties. Mr. Traynor was looking for a contribution from Dr. Smurfit. While Dr. Smurfit recalls that he declined to make a contribution, he does not recall whether he declined in the course of that conversation or in the course of a subsequent conversation. Nor does he recall that any particular amount of money was requested by Mr. Traynor, or that Mr. Traynor conveyed any information to him concerning the precise state of Mr. Haughey’s finances other than that Mr. Haughey was in difficulties. In addition to information provided in response to the Tribunal’s queries, Dr. Smurfit has also provided the Tribunal with information concerning other dealings he had with Mr. Haughey. He has informed the Tribunal that in 1990 the Jefferson Smurfit Group made a gift to Mr. Haughey of a painting by Jack B Yeats. This was apparently entitled ‘The Forge’. This presentation was made to Mr. Haughey in recognition of his assuming office at the Council of Ministers on Ireland’s assumption of the Presidency of the European Union. At around the same time, the Jefferson Smurfit Group made another presentation to Mr. Haughey of a painting by Sir John Lavery of the raising of the flag at Aras an Uachtarain. It was a gift to the People of Ireland by the Smurfit Group and the presentation was made to Mr. Haughey as representing the people. Dr. Smurfit understands that this latter painting is now hanging in the State collection. Lastly, in connection with Fianna Fail fund raising, I come to the evidence to be given by Mr. Hugh Dolan. The Tribunal anticipates that Mr. Hugh Dolan, who is a full-time official at Fianna Fail Headquarters, will be in a position to give evidence concerning the circumstances of the inspection of Fianna Fail records by members of the Tribunal legal team in August of 1999 and specifically with reference to the second list, as it has been called, (described as an extract by Mr. Sean Fleming), that is the list of those contributions in respect of of which receipts were not sent to the donors themselves but to Mr. Haughey. Mr. Dolan has informed the Tribunal that at the time he made available to the Tribunal legal team what we now know as the Cash Receipts Book or a list of all Fianna Fail donations. He was not aware of the existence of the second list or extract, as Mr. Fleming calls it. This document was made available to the Tribunal in August of 1999. The list related to 1989 and the 1989 election. At that time, Mr. Dolan was not aware that there was backing documentation in existence in Fianna Fail Headquarters which would have disclosed the identity of those donations described as anonymous. It was around ten months later when he first learned of the existence of backing documentation which would enable the identity of anonymous donors to be ascertained. It was also only in or around that time that he became aware of the second list. At the time he became aware of the second list, he did not advert to the fact that Tribunal counsel were not aware of the existence of this second list or of this additional backing documentation. He became aware of that second list in the course of responding to queries from another Tribunal. Some short time after, he received further inquiries from Mr. Davis, solicitor to this Tribunal, and in response, informed Mr. Davis that there was additional information which he might wish to inspect. Copies of that additional material, including some of the documents mentioned in evidence already and including the second list, were then made available to the Tribunal’s solicitor. 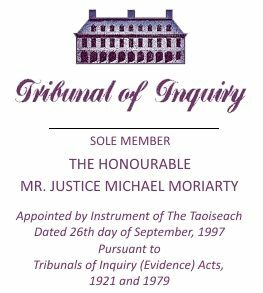 I think it’s appropriate, Sir, that I should indicate the extent of the Tribunal’s interest in these two areas of inquiry – the Brian Lenihan fund and Fianna Fail fund raising efforts. The Tribunal’s interest in these matters is twofold. Firstly, in light of the evidence to date and the information made available to the Tribunal, a question which arises in the context of payments to the Brian Lenihan fund is whether those payments were lodged, as appears to have been intended, to the Leader’s Allowance Account and assuming they were so lodged, whether in fact they were used for the purpose of discharging Mr. Lenihan’s expenses. The Tribunal therefore to date has endeavoured to form an impression of the total size of the fund assembled for the purpose of discharging Mr. Lenihan’s expenses. Next, it has endeavoured to establish whether all of the fund actually assembled was paid into the Leader’s Allowance Account. Secondly, whether the funds collected for Mr. Lenihan and lodged to the Leader’s Allowance Account were in fact used to discharge the expenses of his treatment and if so, how much of the funds were used for that purpose. Analogous or related questions arise in connection with Fianna Fail fund raising, especially in 1989. From the evidence to date, it would appear that just as in the case of the Brian Lenihan fund, payments intended or apparently intended as political donations to Fianna Fail do not appear to have reached the Party or at least do not appear to have reached the Party in the form originally intended. The Tribunal has focused, to some extent, on Fianna Fail fund raising because of information it has obtained and the evidence given to date connecting payments to Fianna Fail for political purposes with payments which may not have reached Fianna Fail and which may ultimately have been used for the benefit of Mr. Haughey. In relation to each of those payments, questions arise concerning the circumstances in which the payments were made and in particular, the fact that the payments were made in circumstances which were or which appear to have been quite unusual. It is the circumstances surrounding these payments which warrant further inquiry. Obviously in characterising the circumstances in which payments of this kind were made, it has to be borne in mind that secrecy, to a lesser or greater degree, appears to be a feature of political fund raising in this country. Whether this is appropriate or not is beside the point as far as the Tribunal is concerned, at least at this evidence gathering stage. What the Tribunal has to take into account is whether the degree of secrecy in the case of any one or other payment or other features of any of the payments under review warrant findings within the Terms of Reference. Apart from the degree of secrecy, the other unusual feature of some of these payments which warrants further inquiry are the fact that for instance payments were made by way of instruments which effectively amounted to cash, in the case of cheques made to cash, or were routed to Fianna Fail or to Mr. Haughey himself by unorthodox channels, in one case at least to date, through an offshore Ansbacher account. There’s one final matter I want to mention in this outline and this concerns evidence which the Tribunal anticipates from Mr. Dermot Desmond. In the Tribunal’s last outline statement it was mentioned that evidence would be given by Mr. Desmond in connection with his involvement in Feltrim Mining or Minmet plc as it’s now known. In addition to evidence from Mr. Desmond concerning his subscription for shares in the company in July of 1990, and a loan which he provided to the company of £50,000 in 1992, the Tribunal will also hear evidence in relation to a guarantee provided by Mr. Desmond to Allied Irish Banks in respect of the liabilities of Feltrim. This guarantee, it will be recalled, or the existence of it, emerged in the course of evidence heard by the Tribunal at its last sittings.